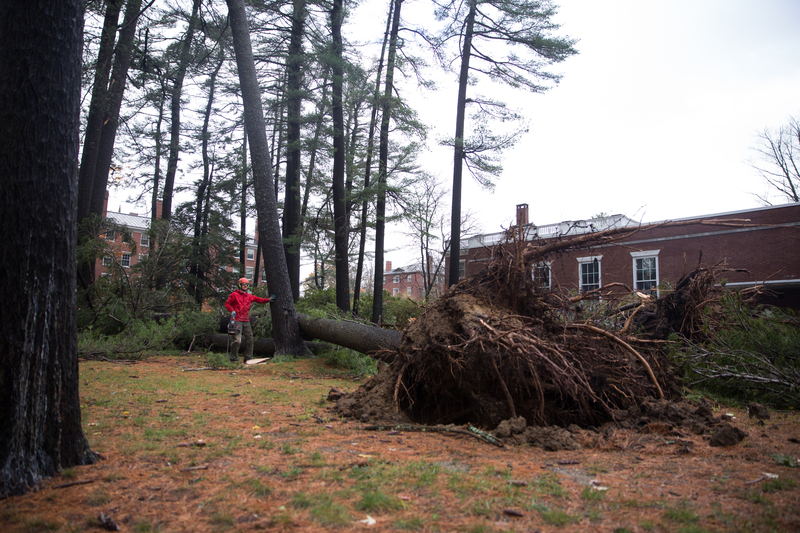 On October 30, a severe wind storm knocked out Bowdoin's power for nearly 48 hours. The Orient looks at student and staff responses to the incident. In addition to waking up without power Monday morning, Bowdoin’s campus awoke to the loss of some of its oldest residents—three trees on the Main Quad. Two oaks and one maple fell as a result of the storm that blew across campus early Monday morning. Even though the storm was strong enough to knock power out of most of Brunswick for almost 48 hours, many were surprised it was able to take down the dependable trees that have held hammocks and slack lines for years. According to Barry Logan, professor of biology and the chair of the biology department, the trees may have fallen due to a combination of factors, including the fact that the wind came from the southeast, rather than from the northeast, which is more typical in New England. Trees in New England also typically have a relatively shallow root system due to a thin layer of soil above bedrock, according to Logan. This fact, combined with the heavy rains that loosened the soil, compromise the ground’s ability to stabilize the roots and thus keep the trees upright. Additionally, the trees that fell still had their leafy canopy, so they caught more wind than leafless trees would have. Logan, who teaches Plant Ecophysiology this semester, took the situation as a teaching opportunity and asked his class to share observations about the trees after they had fallen. One of his students noted that the wind that hit the fallen trees may have been channeled between buildings and therefore intensified. “So there were some unique aspects of this storm that might have facilitated the kind of damage that we experienced, even if it wasn’t a super dramatic storm,” said Logan.